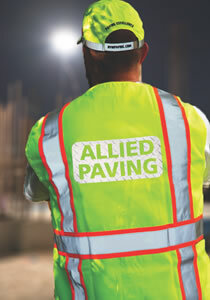 Call 800-619-1110 now to speak to a friendly and knowledgeable sales representative! Pricing is per location. Applies to all apparel. 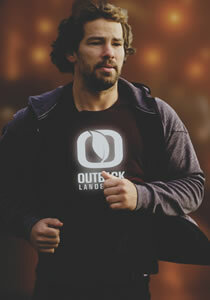 New Logo Set-up: $45 per logo placement. Not recommended for logos with small details or small text. *WHEN ORDERING 12 OR MORE PIECES! Valid on Logo A only, or Logo B for only $2.00. How To figure Logo Pricing: Multiply desired logo height x desired logo width = Total square inches. Example: If logo is 1.5" high x 4" width (1.5 x4) = 6 square inches. Logo Option "A" is the most common size. 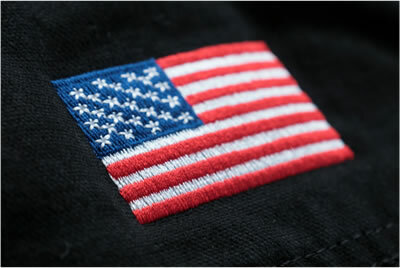 Embroidered flags can be added to most garments with our state-of-the-art embroidery machines and premium embroidery threads. 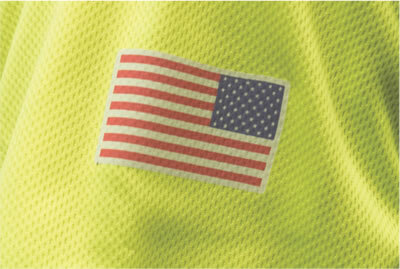 Reflective flags can be added to most garments and have a highly reflective background that adds an element of safety in low light situations. 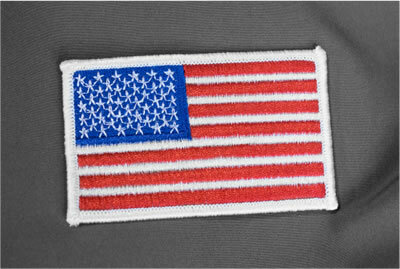 Embroidered flag patches can be sewn on to most garments and look great on jackets and unifroms. THIS ITEM IS NO LONGER AVAILABLE!